LONDON • Pep Guardiola revealed he has "one eye" on keeping Manchester City's faint hopes of reaching the Champions League semi-finals alive ahead of today's Manchester derby. 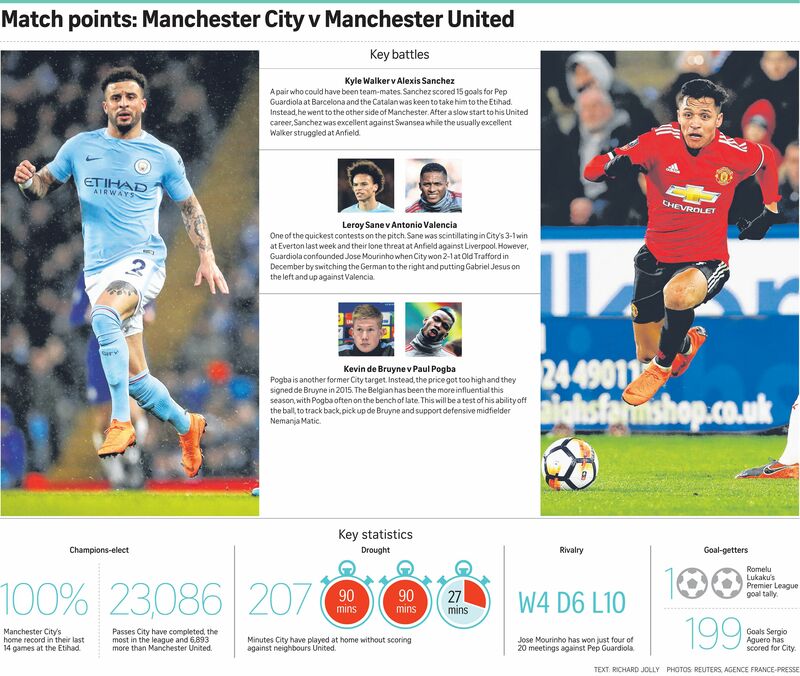 A victory against Manchester United at the Etihad Stadium would see City crowned Premier League champions in record time following a trophyless season. In normal circumstances, winning a derby to secure the league title would be the undoubted focus, but Guardiola acknowledged that the return leg of their European quarter-final against Liverpool three days later is no less important. City are on the brink of exiting the Champions League after losing 0-3 in the first leg at Anfield on Wednesday. With the second leg coming up on Tuesday, Guardiola is trying to keep his players fresh for a potential comeback. "We are thinking about recovering the players, about playing in front of our fans, creating a good game to put them (Liverpool) under pressure," he told a press conference yesterday. "They're almost qualified but we have 90 minutes. The door is almost closed but a little bit open and maybe there is some space for us to get in." They're almost qualified but we have 90 minutes. The door is almost closed but a little bit open and maybe there is some space for us to get in. PEP GUARDIOLA, Manchester City manager, not giving up despite Liverpool having the upper hand in their Champions League quarter-final tie. My motivation is to finish second. My objective for tomorrow is to try to have points to finish second. JOSE MOURINHO, Manchester United manager, on his targeted outcome from today's Manchester derby. City are in the middle of a relentless schedule, with Tuesday's home match followed by a Premier League trip to fourth-placed Tottenham four days later. Guardiola suggested that he would keep his options open regarding team selection, but is expected to rotate his squad over the next week. "We have three massive games - United, Liverpool and Tottenham," he said. "We have just a few days between each game. We have to see the condition of the players. We will have a training session and we'll speak with the docs and see what's the best team. We'll pick a team to win the game against United. "We are going into it to win it. We have one eye on Tuesday though. Whatever happens tomorrow we'll have six more (games in the league)." Guardiola is unlikely to risk top scorer Sergio Aguero, who has not played since suffering a knee injury during training on March 10. The City manager refused to commit himself publicly as to whether Aguero - who has scored eight times in 11 appearances against United - will be fit for the Liverpool game but will give the striker every chance to recover. Guardiola believes a good result against United would give his players the boost they need before taking on Jurgen Klopp's men. "The result against United will help emotionally to prepare for the game on Tuesday," he said. United manager Jose Mourinho is still looking for a first league win over City since taking over at Old Trafford in 2016. And he insisted halting his rivals' title coronation does not give him more impetus. "My motivation is to finish second," said the Portuguese, who confirmed that defenders Phil Jones and Daley Blind have returned to training, leaving goalkeeper Sergio Romero as the only player on the sidelines. "My objective for tomorrow is to try to have points to finish second."